Welcome to the Miracles of South Africa Adventure! Your adventure starts at King Shaka Airport in Durban, where you’ll be met by your guide, Velile Ndlumbini, and driven to your Mthatha. 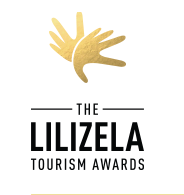 You’ll spend two nights in this area visiting the sites of the Mandela legacy. From there, we visit the Wild Coast staying right at the sea front at Prana Lodge and again spend two nights, only this time engaging with Steven Biko’s legacy in and around King William’s Town. From Prana Lodge, we’ll visit the ‘City of Saints’, the historic town of Grahamstown where you’ll learn of the legacy of Chief Makana. Finally we end off on safari at Greater Addo National Park with two nights at The Elephant House. On your last day, you’ll be transported to Port Elizabeth Airport. 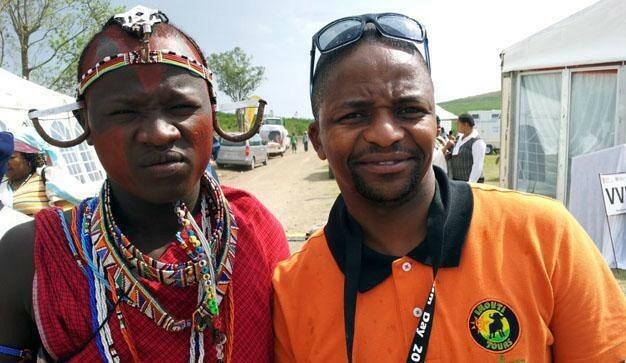 You’ll be collected from King Shaka Airport in Durban by Velile Ndlumbini, your guide for the next six days. It’s a long drive of five hours from Durban to Mthatha, so we’ll break it up with a visit to Kokstad, a small town at the slopes of the Drakensberg Mountains almost on the border between KwaZulu Natal and the Eastern Cape. We’ll take a tour of town, learning of the history of the Griqua people and Adam Kok III who founded the town. 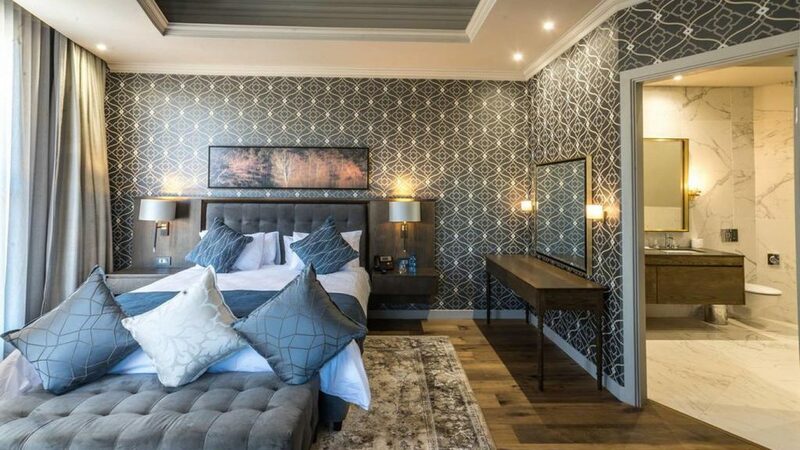 We’ll arrive at The Mayfair Hotel in Mthatha that evening: this brand new (built in 2016) four-star hotel has really set the bar high for this part of the country. The following morning, we’ll set off on the trail of Nelson Mandela. Born in to a poor rural family but raised through a stroke of fate as a member of the royal amaThembu household, Mandela was both a cowherd, a stick fighter, a royal prince and a pupil of a missionary primary school (where he acquired the name ‘Nelson’). You’ll visit the sites of Nelson Mandela’s early childhood, his training as a prince and visit the site of his burial. 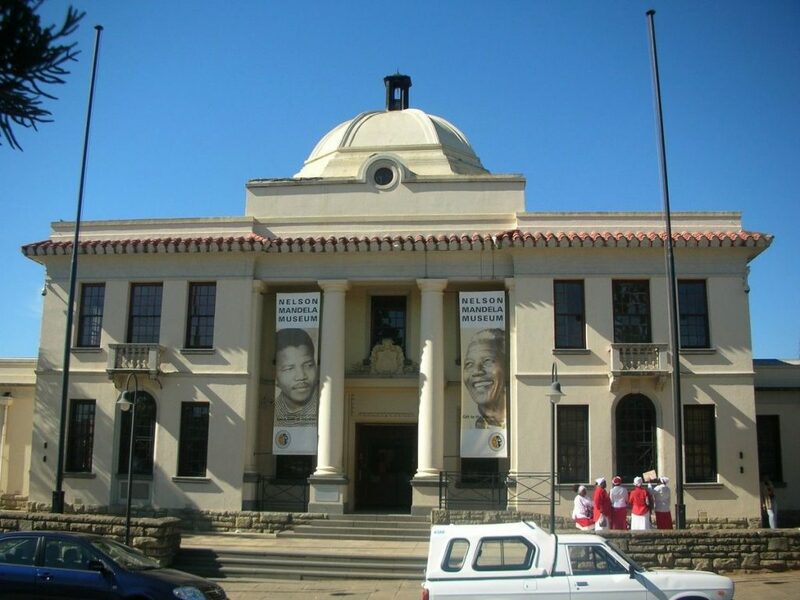 There will also be time to appreciate the full scale of his legacy at the Nelson Mandela Museum in the centre of town. After breakfast at The Mayfair, you’ll be collected again by your guide and driven to your next loding, Prana Lodge. Set high on the sand dunes above the Indian Ocean and near to the river mouth of the Cintsa River, this splendid five-star retreat will be welcome after the drive through the Eastern Cape countryside. You’ll have time to take in the views, swim in the pool and stroll through the town of Cintsa. The following morning, Velile will collect you again and you’ll be taken to King William’s Town, the birthplace and resting place of the great Steven Biko. Biko founded the Black Consciousness Movement, around the time that Martin Luther King and Malcolm X were at the peak of their activities in the USA. Similarly to other iconic black leaders of his time, the BCM was not a racial movement, seeing all races as equal, but that some races set out to oppress others. Biko’s most famous work, ‘I Write What I Like’, a collection of his writing and interviews with him was only published after his death at the hands of the apartheid regime (who saw him as extremely dangerous). You’ll visit the splendid legacy building built to Biko’s memory in the centre of King William’s Town, as well the memorial built to him and visit some of the important sites of struggle in the area, which would have shaped Biko’s thinking at the time. After our time in the eastern half of the Eastern Cape, today we arrive in the western half, crossing the Great Fish River which was for many years the ‘final frontier’ between the British colonialists to the west and the isiXhosa people to the east. Today is a relatively short drive, so after you’ve been introduced to your room at 8a Grahamstown, we’ll set off for a light lunch on the High Street. 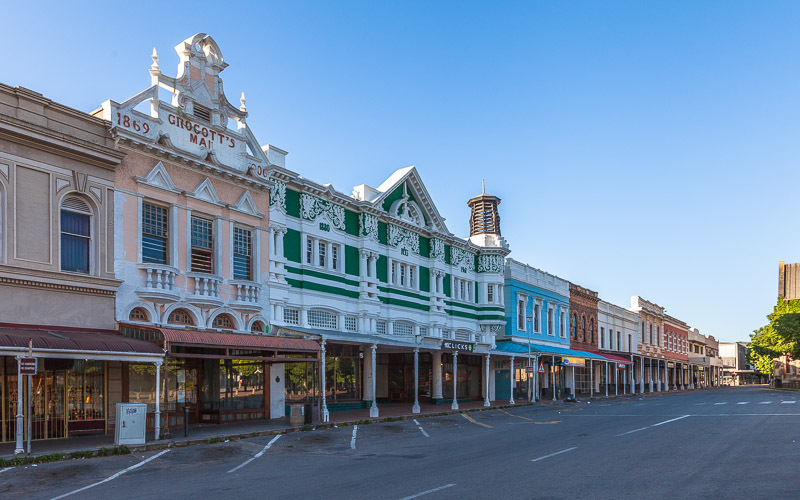 We’ll then take a walking tour through this beautifully preserved Victorian settler town, including through the campus of Rhodes University which dominates it. You’ll visit the cathedral and the site of the Graham’s Town Journal, the oldest African newspaper still in existance. The following day, we’ll take a longer, driven tour of the area, learning of the history of Chief Makana and the uprising that shaped the entire history of the country. In a bold move, Makana almost managed to defeat the British forces holding the then ‘outpost’ of Grahamstown but finally being captured and sent to Robben Island. This tour will be lead by Allen Weyer of Spirits of the Past: he’ll take you high into the hills above the city and show you the layout of the battle and explain its implications. 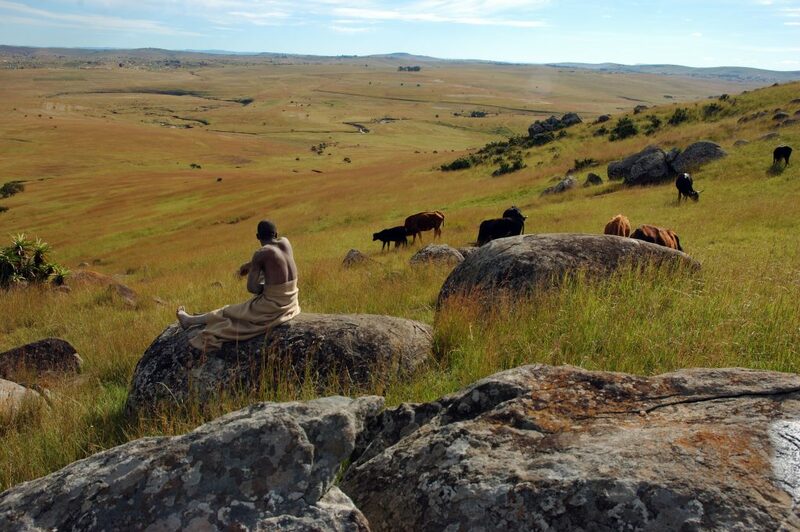 Afterwards, we’ll travel to Fingo Village, formally the home of a group of the Mfingu people, to understand the significance of the Egazini Monument. For your last two days, we’ll spend time experiencing the miracle of conservation that is Greater Addo National Park. Originally known at Addo Elephant Park, it’s soon going to be what is known in conservation circles as a ‘mega-park’, rivalling in size and scope such global wonders at Kruger and the Serengeti. When completed, it will stretch across 3600 square km, including a mountain, bush, forest, dune, beach and marine section. It is planned that it will be the only park in Africa where the Big Seven can be seen in one park (being lion, elephant, rhino, buffalo, giraffe, Great White Shark and Southern Right Whale). To visit Addo requires the help of experienced rangers as it’s so vast, so with this in mind we’ve used the services of The Elephant House. 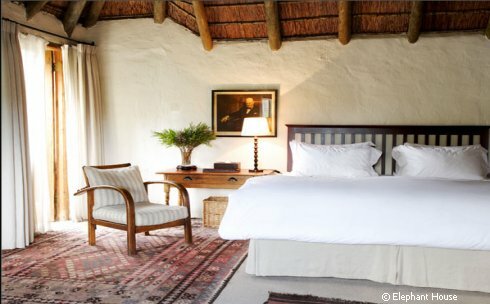 Situated near the main entrance to the Addo Elephant National Park (now called Greater Addo), The Elephant House is a rambling colonial farmhouse with thatched roofs, offering that special style of colonial luxury that is unique to South Africa. Anne and Clive, the owners, have taken exceptional care of the place. The house is beautifully decorated, with a homely dining and sitting room, Persian rugs, a private art collection and lovely verandas with comfy couches to wile away your days in peace. 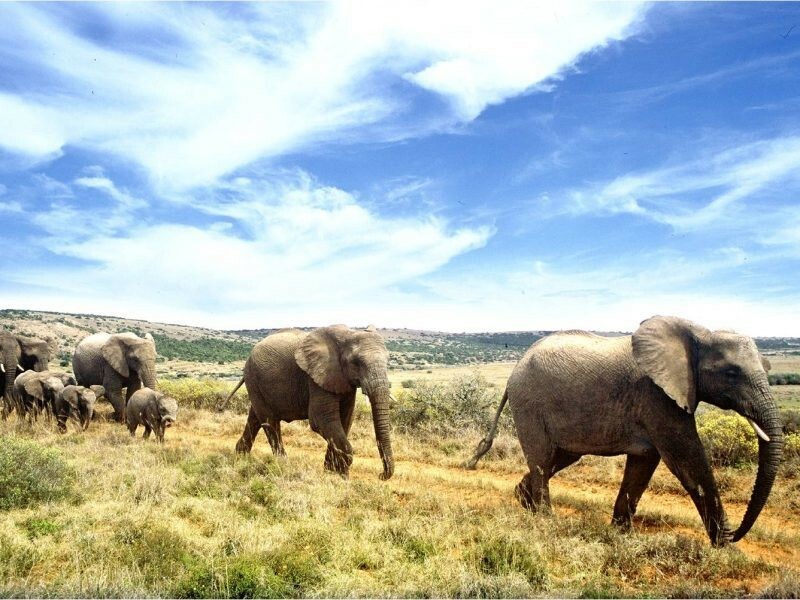 Greater Addo is actually a collection of four smaller parks: the Addo Elephant Park, The Woody Cape Nature Reserve and two marine protected areas, Bird Island and St. Croix Island. Greater Addo is still being built (it’s a twenty-year project) and when complete, will rival Kruger National Park in size. It will also be the only wildlife park in the world that will house all ‘Big Seven’ animals (lion, elephant, leopard, buffalo, rhinoceros, great white shark and southern right whale). On your last day, you’ll be transferred to Port Elizabeth Airport from The Elephant House. Bon Voyage and we’ll see you in Cape Town for Miracles of the Western Cape!